The White House said it was “the toughest sanctions regime ever imposed” on Tehran. It targets both Iran and states that trade with it. However, temporary waivers will be granted to eight countries to allow them to continue importing Iranian oil. EU states that backed the nuclear deal have said they will protect EU firms doing “legitimate” business with Iran. 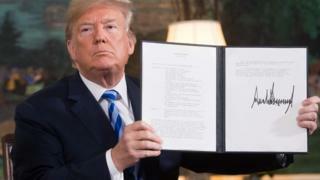 President Donald Trump withdrew from the agreement in May, describing it as “defective at its core” because it had not stopped Iran developing a ballistic missile programme and intervening in neighbouring countries. The US has been gradually re-imposing sanctions, but analysts say this move is the most important because it targets the core sectors of Iran’s economy. The UK, France, Germany, Russia and China were also parties to the 2015 accord and have stuck to it, saying Iran is complying. US Treasury Secretary Steven Mnuchin also said that the Brussels-based Swift network for making international payments was expected to cut off links with targeted Iranian institutions. Being disconnected from Swift would almost completely isolate Iran from the international financial system. US Secretary of State Mike Pompeo set out 12 demands that Iran must meet if sanctions are to be lifted – including ending support for militants and completely ballistic missile development. Mr Pompeo said did not name the eight countries that been granted waivers to continue importing Iranian oil. He said the eight had “demonstrated significant reductions in their crude oil and co-operation on many other fronts”. Two would eventually stop imports and the other six greatly reduce them, he added. US allies such as Italy, India, Japan and South Korea are among the eight, the Associated Press news agency reports. Turkey also obtained a waiver, Reuters says. All have been have been top importers of Iranian oil. He said there was “no possibility” that the US “will attain its political goals through such sanctions”. Over the past six months the Trump administration has pushed a goal of getting Iranian oil exports as close to zero as possible. But the balance between supply and demand in the oil market is fairly tight, so it has to calibrate accordingly. It does not want to drive all the Iranian oil off the market on 5 November because that could spike prices. This would benefit Iran, and anger Americans at the petrol pumps. The US has increased its own production to fill in the gap left by Iran’s oil and urged others to as well, especially Saudi Arabia. It has also granted permission to eight countries to continue imports of Iranian oil after intense lobbying by some of them. Officials haven’t said which ones yet, but the list is expected to include India and possibly China, two of Iran’s biggest customers. But this is at reduced levels and only for six months, at which point the administration will reassess the oil markets. And the money from these sales will go into an escrow account to be used for permitted goods and services, so Iran won’t get the cash. Results so far show what the US can achieve with the big stick of its enormous economic power. But isolating Iran through force alone, absent the united political front of its previous partners, will continue to require a balancing act.